Google Brand Accounts can link many Google services, including YouTube, Google Photos, etc. Using a Brand Account rather than a personal account allows you to authorize access for multiple users and give them managerial permissions. If you are working with an agency, you’ll want to give them access to your Youtube account so they can manage your videos, run ad campaigns, and make use of YouTube Analytics to measure success and develop new ideas for video campaigns. If your Brand Account is already linked to your personal account, click on your account, find “Switch Accounts” in the dropdown menu, and select the Brand Account you wish to switch to. This will log you into your Brand Account. 2. Go to Settings and find Managers. This will be a section at the bottom of the Settings menu. Click the link that says Add or Remove Managers. 3. Click Add New Users. 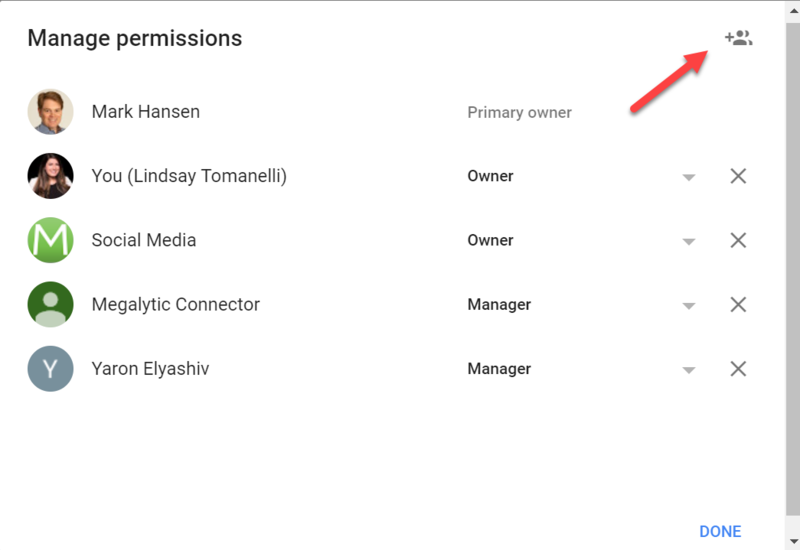 This button is in the top right corner of the Manage Permissions window and looks like two people and a plus sign. 4. Add names or email addresses you wish to associate with your Brand Account. 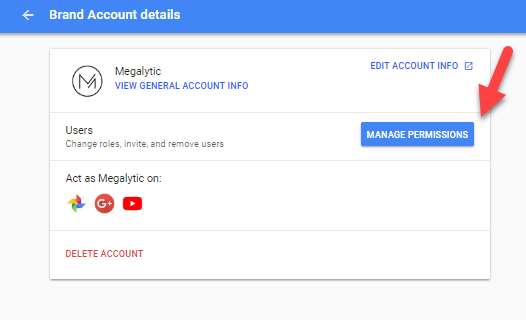 You can add individual email addresses or find them by name if they’re linked to the Google account you are currently using. 5. Give these users Manager Access. Owners control who else can manage the account, so it’s best to keep Owners within your business. There will always be one Primary Owner who can add other Owners to the account. 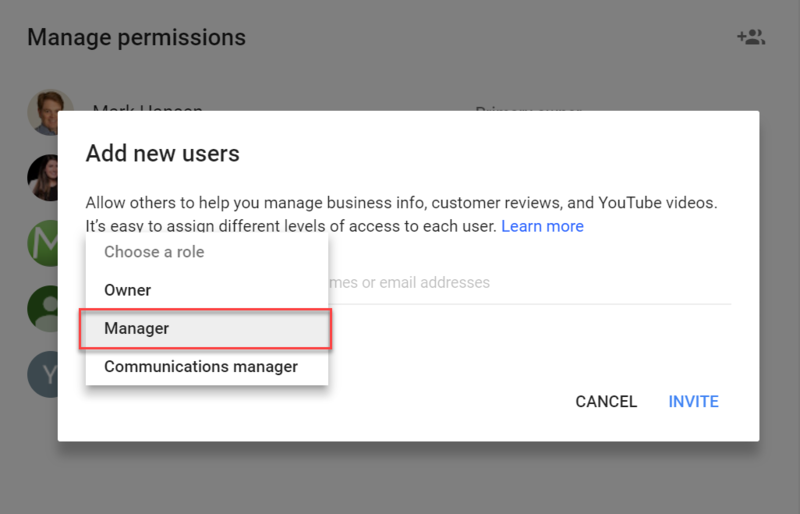 Manager access allows users to post videos, read and manage comments, see channel analytics, and edit account details, but they cannot delete the account. Manager level access is the most common to give to an agency. The users at your agency who have been given Manager access will then receive an email invitation. If they accept the invitation, they will be granted access. With access, they can switch to your business’ Brand Account in the same manner that you do and utilize Youtube to best promote your brand and company. 1. Find the Brand Accounts section of your Google Account and choose your account. This section can be found by going to https://myaccount.google.com, Clicking Personal Info & Privacy, Clicking on “Go to Google Dashboard”, and scrolling down to Brand Accounts, or by clicking here: https://myaccount.google.com/brandaccounts. Find the Brand Account you wish to manage under Your Brand Accounts. This will be a large blue button next to Users and will bring up a pop up window displaying all of the users who have been given permission to access this account. 3. Select their role in order to change or remove it. If you are the Primary Owner of the account, you must give Primary Ownership to another person before you leave the account. Only Owners can delete the account entirely.